How do you review a book like Buffy? Very carefully, I suppose. I subscribe to the school of thought where reviews are for people who are looking to get into something, not just gain affirmation of their beliefs. Sure, it’s nice to see that the critics agree with your own personal top ten movies of all time, and we all enjoy discussing books, but generally when people look for a review they want to know where to put down their hard earned cash and spend their ever more rare free time. 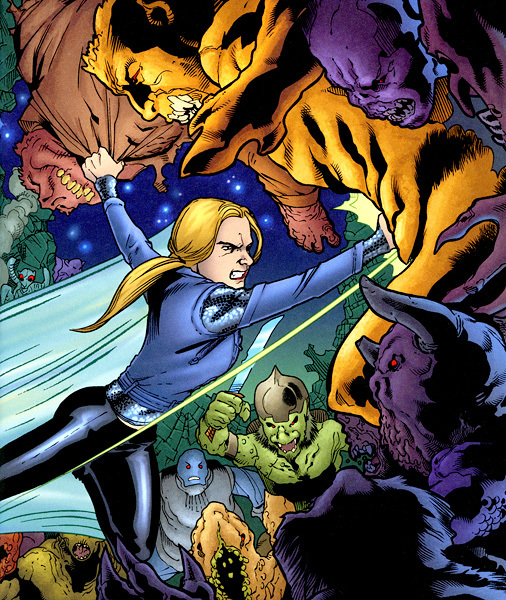 A main part of the appeal of the Buffyverse comics is the “what happens next” aspect. We’ve followed these characters through seven years of one show and another five of second (sometimes overlapping.) The creative team has grown in skills and stature and the characters have grown with them. Those of us who are serious fans have watched and re-watched, but that first time through was a doozy. So, assuming you’re interested in the Buffy comics and have somehow missed the rampant spoilers out there on the net, this review is for you. This is the seventh book in Season 8 – and its time for a big crazy reveal and a whole lot of plot exposition. The main feature here, which continues the story from the previous volumes, is handled by writer Brad Meltzer and artist Georges Jeanty with Andy Owens and Michelle Madsen on inks and colors. There’s also a Joss Whedon sandwich of sorts, as this volume collects his short intro “Turbulence” and then is backed up by the Willow: Goddesses and Monsters one-shot. There is a small cover gallery plus a couple sketches rounding out the back. All in all, a nice size book at 160 pages – and surprisingly only 7.99 right now on Amazon. I have to admit that I’m quite pleased with Dark Horse’s collection style lately. To the meat of the content. The Whedon-speak comes quick and heavy in the first few pages. It’s been a little bit since the last volume was released and it took a minute to get used to the banter style again, especially reading it instead of hearing it. I actually went back to the last volume and flipped through it to refresh the plot, even though there was some not-so-subtle stating of this volume’s status quo. It’s always nice to see the Buffy comic embracing the medium just as the television show dissected the tropes of the tube. 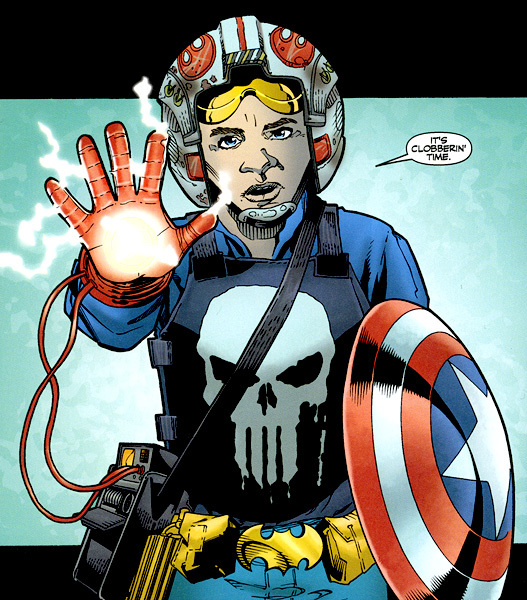 It’s obvious that Whedon and Meltzer are fans as much as they are creators. I came into the book having heard very mixed reviews and actually expected not to like it (even though I loved the previous volumes, despite some ups and downs.) I was only able to remain skeptical for two pages before I was stiffing laughs. I was particularly tickled by riffs on a couple other pop culture phenomena that may or may not rhyme with pie-light and fairy trotter. Starting with such strong crowd pleasing moments was smart, because the middle does sag, and if I wasn’t warmed up I might have come away with a very different feeling on this book. As it is, there are some extremely awkward scenes here. I’m very limited in what I can show in this review’s scans in order to avoid spoilage, but suffice to say that this book isn’t really for kids. The show never was either, but it rubs it in a little here, though never in a ratings committee kind of way. Still, while it may have gone on a little long, the point was made (thankfully, no page turns in this book without some kind of joke, usually pretty amusing). As with many Buffy seasons, it tends to get a little worse before it ends well. That’s evident here. It’s only a little worse, but the impression is of a “plot” episode, instead of one where the overall arc moves organically while the characters get to have really fun adventures. Except for the Willow story, the whole volume is devoted to moving the plot forward, and… it… must… do… it. And then, of course, it ends on another reveal/cliffhanger. Even with this – I wasn’t dissuaded. The second I finished, I went through the mental motions of reaching for the next volume and then cursing. The book had me and I wanted more more more. So they’re doing a lot right. Jeanty, who is often excellent at carrying the character emotions we know so well, has some problems with the art in this book and I stumbled on it a couple times as I read. I noticed a few places where heads were way too big for bodies, or faces looking too similar caused confusion. I dislike when I have to go back and forth between panels to figure out who just got smacked down – such things should be obvious, and I shouldn’t have to be comparing hair colors. Especially when red-brown looks a lot like red-red. I was pretty forgiving, as I often am with these books, because the work was serviceable and did the jokes and action sequences justice. I just wish the people always looked like who they are. The Willow: Goddesses and Monsters story did a little to sooth the pain, but mainly because it took me out of the immediate “What happens next! ?” mindset. The story itself didn’t feel very special, though it had a couple giggle moments and some fun character designs. Like many one-shots, it seeks to do a little expansion on the character, but doesn’t actually reveal anything plotwise that we didn’t already know. So, fun, and I’m happy they included it here for sake of completeness, but nothing special. The art for this story, by Karl Moline, is more interesting, though has a few facial shifting problems as well. I understand when he wants the faces to look more cartoon-like to show emotion, but there are other times where it seemed less intentional. Regardless, the characters have life to them and I particularly enjoyed the designs and interpretations of the magical denizens. There is even one absolutely beautiful cameo panel of an unexpected character. The book as a whole? A bit of a speedbump, perhaps, but I remain with high hopes for the series. I’m looking forward to the next book. As much as I love this ongoing, and wait with baited breath for each trade, this book gets 3 out of 5 stars. It’s just not the best of the bunch, even though it has some winning moments. While it’s rated lower, it’s still a must purchase, because the books before or after it just won’t be as good without this one in the middle. For Buffyverse? Yes. This is the continuation of the latest season – no getting around it. 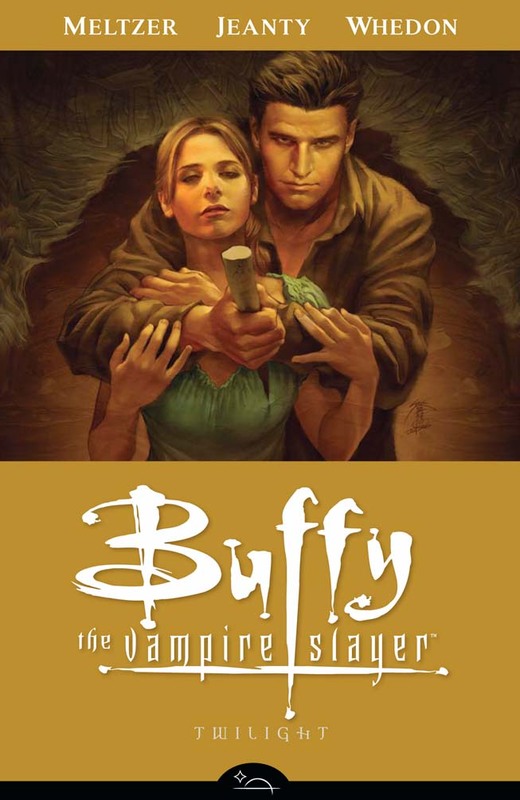 You need to have seen the TV series, and read volumes 1-6 of Buffy the Vampire Slayer: Season 8. You also should also have read Fray before that, and need to read at least the Oz stories from Buffy The Vampire Slayer Omnibus Vol. 5. If you are ever planning on reading the Angel: After The Fall series (which follows up from his show) you will enjoy them much more if you read all of them before you read any Buffy The Vampire Slayer Season Eight. I won’t tell you why, but just trust me on this one, ok? Actually, there are few enough books in this universe that you might be best served by following the Buffyverse reading order exactly – there’s a lot of good stuff on there that isn’t essential to this run as well. Buffy The Vampire Slayer Season Eight Vol. 8! When does it come out, damnit? It’s really worth it. One of those things that is MUCH better if you follow the whole plot. Yeah so I’ve heard. I’m a huge vampire freak so it’s definitely on my list. It’s probably my favorite (and only one I’m really into) vampire property. It’s so tongue in cheek, and very well character driven. By the way, you can hit the reply button below a post and talk in that thread – that way if someone else posts an unrelated comment, it doesn’t go between the rest of the discussion. Let me know if it’s not working for you. It’s working. I just didn’t think about it.